From Goodreads: After staking out, obtaining, and then being forced to give up her first boyfriend, Josh, all Cammie Morgan wants is a peaceful semester. But that's easier said than done when you're a CIA legacy and go to the premier school in the world... for spies. I officially love this series! The first book, I'd Tell You I Love You, But Then I'd Have To Kill You felt like a guilty pleasure - a book I really enjoyed but felt I shouldn't. After reading this one I no longer feel guilty! I positively enjoyed it and can't wait for more. Cam is back and exactly the same as before. I really like her and her witty observations. Her friends are ace as well - I love Bex and Macey's attitude, and Liz's clumsiness. She really makes me laugh! And of course I love all the spy stuff! 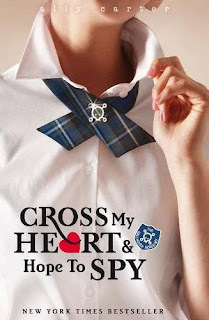 I love the whole concept of a spy school and think it's a superb basis for a series of books. There were some great actions scenes and the whole book felt exciting - with a mystery to solve and a romance. I enjoyed watching Cam and her friends try to work it all out - how they think they have the answers but just end up with more questions! I must admit I did twig what was going on but it didn't spoil my enjoyment one bit. I also liked the romance and felt there was some great chemistry this time. I guess sometimes 'bad boys' really are more appealing! I really hope we get to see much more of Zach. There was also really good continuation here from the first book. We get more snippets about Cam's father and it is implied there is more to the story than she realises. I'm hoping this will be something we find out more about in future books. I also liked the way events in the previous book were alluded to and that it had a impact on events in this book. I was glad we got to see Josh again and Cam's reaction to it. This is just such a fun, light read and I recommend it wholeheartedly. I hope the series continues to go from strength to strength and am really looking forward to Don't Judge a Girl by Her Cover when it's released in the UK. What cover is that? It looks different from the ones I've seen. I just read the first book and really liked it! I want to read the rest of the series. And yes - where is that cover? I've seen what I think are the UK ones, but I didn't think this was one. I loved the first book so I definitely need to get my hands on this according to your review! Chapter Chicks & Jill - The cover is the UK one:) I love the UK covers for this series. Ooh, this seems like a fun series! Great review! I loved the first three books in this series, and I can't wait to read this book! Great review.